Soaring Spirit is Valmiki Faleiro’s second individual venture in writing a book. His collaborative works have been many. One of them is In Black and White. Here he contributed two stories to a collection of insider experiences penned by various other journalists. But his much praised pièce de résistance remains Patriotism in Action, the first book authored by him. A well-known former working journalist, Valmiki Faleiro was employed by the defunct West Coast Times and was the Goa correspondent for national newspapers such as the Indian Express. He has contributed as a freelance journalist to The Navhind Times, Goa Today and other publications too. Feeling disillusioned by prevailing conditions in the field of journalism, he started a successful business of real estate, and from 1985 to 1987 was the municipal president of Margão. He returned to writing in 2005, with his Sunday column All n Sundry in the oHeraldo. In 2009, he decided to take up full-time writing. To understand the motivation behind Soaring Spirit, one needs to investigate the significance of Faleiro’s maiden book, Patriotism in Action. There existed an atmosphere of animosity between the Hindu and Catholic communities right from 1961, owing to the perception of the Hindu community that the Catholics were a favoured lot under the Portuguese regime. Even though this may have been true at the beginning of the Portuguese rule, Faleiro says, ‘Later there was a section of the Hindu community that was favoured by the Portuguese. They were the ones enjoying all the privileges of the state.’ These were the Saraswat Brahmins. Citing the example of the dominance of Hindus in the mining industry under colonial rule, Falerio debunks the notion of Catholic supremacy during the period. Liberation in 1961 gave disgruntled Hindus the opportunity to take back what they believed had been denied to them: the right to bring about social change as they deemed fit. However, the government that set out with the mission to encourage development, was unable to deliver the goods as legislations failed to mark positive change, particularly in the area of agriculture. Tension between the two communities heightened with the prospect of the merger with Maharashtra and the Opinion Poll in 1967, but subsided thereafter. Faleiro’s father, a doctor, had served as defence officer in the Indian Army even before India’s independence. He held the aspiration that his son would follow him into the defence forces but he passed away on the eve of Faleiro’s SSCE results. To honour his father’s desire in some way, Faleiro decided to investigate and put together stories of Catholic officers in the Indian Army and called the compilation Patriotism in Action. It was his response to the insult of being anti-national that was heaped on the Christian community. Faleiro first documented his findings in a series of articles in the oHeraldo. One of the stories he wrote was about Wing Commander Clarence D’Lima saving the life of former Prime Minister, Morarji Desai, and losing his own life in the process. Selected as a VIP squadron pilot, D’Lima crash landed the aircraft in some wet paddy fields after sending the VIPs to the tail of the plane. This was because the lack of lighting at the Jorhat (Assam) airport runway would not permit a normal landing. Proceeding with the book was a painstaking effort. The numeric strength of the army and the location of records in each regimental centre made it a gargantuan task. After being appraised of the situation by General Sunith Rodrigues, former Chief of Army Staff of the Indian Army (who also happens to be the only Goan to have served in this position),Faleiro refused to back down. He slowly began to build contacts through networking and accumulate information to write his book. It was revealed that out of hundred commissioned officers across the three armed services, ninety were Goan Catholics, ten were Goan Hindus, and of those ten Hindus, five belonged to the section of elite Hindus spoken of before. Taking the Goan community as a whole, Faleiro says, ‘The contribution to India’s defence per capita has been one of the highest among all the regional communities of India. Once again Goan Catholics stand accused of decadence and anti-nationalist sentiments owing to the influence of Western culture and Soaring Spirit attempts to, in a small way, refute the falsification of the history that contributes to these ideas. The book primarily deals with the history of the Holy Spirit Church in Margão, which was built in 1565 according to the Julian calendar and acted as the base for the Jesuits to engage in the complete evangelisation of Salcette. At one point of time, all the natives of the place were Catholic because those who resisted conversion were asked to leave the place on a number of occasions. At times they would have to leave in a hurry, selling their property and assets. This was part of the religious persecution of the Portuguese. Another reason to write the book was to make people aware of little known or forgotten facts such as that Margão was the principle village of Salcette and Salcette was the principle taluka of Goa. Faleiro promises a more in depth research about Margão and Salcette in his next book called Mathgrām to Margão (Mathgrām means village of religious schools). Dwelling on some of the interesting facts in the book, Faleiro tells us that the most intelligent people in Goa were said to be the gaunkars of Cortalim and Quelossim. The people of Cortalim were credited with having taught the other villages to read and count in the early times. They held the most important positions of Kulkarni (accountant) and clerk in the villages. It is significant that the first convert in Salcette (under the Jesuits) to the Christian faith, called Pedro Mascarenhas, came from this village. In Bardez, which was given to the Franciscans for the purpose of evangelisation, once again the first convert (Mangarna Nayak) came from Cortalim. This dicredits the idea that it is the gullible and the illiterate who would naturally be convinced to embrace the new faith. The fact that it was the Laxmi-Narayana Temple and not the Damodar Temple that was destroyed to build the first construction of the Holy Spirit Church, is clarified by Faleiro. The church was built in 1654 (Gregorian calendar) or 1655 and the Damodar Temple was relocated to Zambaulim in 1567. This is one of many misconceptions that have been dismissed by the book. Soaring Spirit goes on to talk about the Holy Spirit Church and all the other institutions attached to it. There is the Colégio do Esṕírito Santo or College of the Holy Spirit, which served as a high school. Built around the same time as the church, this colégio was frequently shifted to Rachol and back to Margão because of attacks by the rulers of Bijapur. Finally, in 1610, it was permanently established at Rachol and today continues as the Rachol Seminary. There was a hospital called the Hospital do Pe Paulo Camerte situated in nearly the same location as the Holy Spirit Institute. The hospital did plenty of good work and because of this many people converted to Christianity. These included people who would come even from the Bijapur ruled areas for treatment here. Faleiro, furthermore, deals with the various confraternities, the church grounds, the Piazza Cross, different legends associated with the church and the many chapels affiliated to the church. Some of these chapels are now parish churches in their own right. For example, there was the Chapel of the Battalion which served the battalion of hunters (a Portuguese army battalion) posted at Margão. In 1960, the chapel became a church and is today known as the Grace Church. The history and transformation of the houses and the families around the church have been recorded. The stories beyond the brick and mortar are recounted too. ‘Some of the descriptions might not be to the liking of everybody because they are not always flattering,’ says Faleiro with a grin. He looked to his paternal aunt while researching this part of the book and found her extremely knowledgeable. The residents in the vicinity of the church were forthcoming and accommodating when it came to providing information and indicating fallacies. Almost fifty per cent of Faleiro’s time was taken up in just visiting the different houses. The book was completed in a record three months through sheer perseverance. 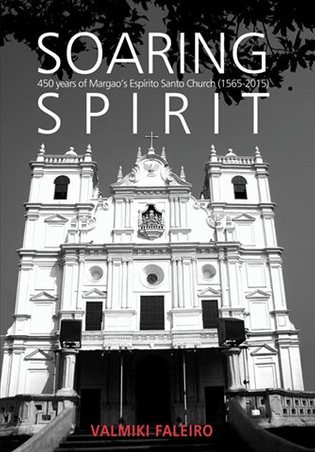 Soaring Spirit: 450 Years of Margão's Espirito Santo Church 1565-2015 will certainly provide history buffs interesting reading with all the details provided. The book will be released on 18th April, 2015, at 5:30 pm at Black Box, Ravindra Bhavan, Margão.